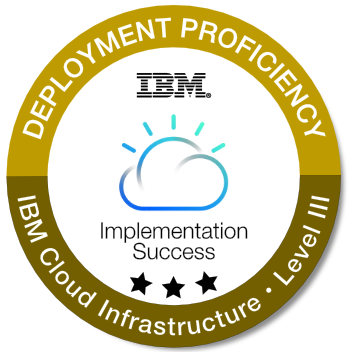 The badge earner (understanding the types of clouds and as-a-service offerings) can analyze, design, architect and demonstrate IBM Cloud Infrastructure based upon the workload requirements from a client, including security, storage, networking, and management. The individual can provide a customer with a logical diagram foundation to meet their requirements and a roadmap to get there. Complete the IBM Certified Solution Advisor - SoftLayer V1 certification. Complete the IBM SoftLayer Solution Architect V1 certification. Complete the IBM Certified Solution Architect - Cloud Platform Solution V2 certification. Document 3 Customer Deployments. Download and complete the Deployment Form. Follow the form's instructions to upload when complete. Following completion of steps 1-3 and receipt of your Deployment Form, IBM will contact you to setup a Technical Interview.